Methods for brokering between services, including, in one exemplary embodiment of a method, providing a first and second service, each service having associated therewith a request and a response data structure, and generating a transformation for producing data conforming to the request data structure for the second service, corresponding to data conforming to the response data structure for the first service. Systems are also described and claimed. There is further provided in accordance with a preferred embodiment of the present invention a system for providing semantic meaning to web services descriptions, including a web services analyzer for analyzing a plurality of web services, each web service having associated therewith a request and a response data structure, and a data schema mapper for mapping the request and response data structures of the plurality of web services into a common ontology model. FIG. 11 is a sample user interface window, in accordance with a preferred embodiment of the present invention. Reference is now made to FIG. 2, which is a simplified block diagram of a transformer, which generates a semantic match between the response of a first service and the request of a second service, in accordance with a preferred embodiment of the present invention. Shown in FIG. 2 are a first service  210, which operates by accepting an input, such as a request message, and producing an output, such as a response message; and a second service 220, which similarly operates by accepting a request and producing a response therefrom. A comprehensive semantic infrastructure can ensure consistent semantics across web services. In a preferred embodiment of the present invention, data structures for the requests and responses of each of service  210 and service 220 are mapped into a common ontology model, through which the data in requests and responses can be given semantic meaning. A class C is said to be a subclass of D if C ⊂D, in which case D is also said to be a superclass of C. In this case, every instance of C is also an instance of D, and properties defined on D can be defined on C by inheritance. For example, a class named Passengers may be a subclass of a class named People. A property such as firstName, defined on People is inherited by Passengers. Referring back to FIG. 2, data structures for the requests and responses of services  210 and 220 are “mapped” into a common ontology model through mappings that identify a correspondence between data constructs of the requests and responses and between data constructs of the ontology, including inter alia classes, properties and combinations of properties. “Mapping” is a process of rationalizing and harmonizing one set of information with another. Many ontology models have been created as a result of mapping. Referring back to FIG. 2, when data structures are mapped into a common ontology model, transformations between the data structures are dynamically generated, on the fly. Transformation  230, from the response data structure of service 210 to the request data structure of service 220, is such a transformation. Thus it may be appreciated that the present invention can be used to provide a service, which itself acts as a broker between other services. Specifically, in a preferred embodiment of the present invention, generation of transformation  230 is performed by a service embodying the present invention. Such a service preferably also executes transformation 230 in order to broker between services 210 and 220. It may be appreciated by those skilled in the art that services  210 and 220 are general request-response oriented services, preferably associated with enterprise information systems. Such services include inter alia web services, remote procedure call (RPC) services, remote function call (RFC) services and remote method invocation (RMI) services. For RFC services, requests and responses are typically passed as function parameters. RFC services include inter alia Common Object Request Broker Architecture (CORBA) systems, and Distributed Component Object Model (DCOM) systems. RMI services include Enterprise Java Beans (EJB) systems. It may be appreciated by those skilled in the art that services  210 and 220 may also be local function calls. Indeed, developers often integrate disparate APIs for local use; e.g., when integrating to software libraries such as dynamic link libraries (DLLs) with Windows, and jar libraries with Java. Reference is now made to FIG. 3, which illustrates matching responses from three services that feed into requests for two services, in accordance with a preferred embodiment of the present invention. Specifically, responses from services  310 and 320 feed into a request for service 340, and responses from services 320 and 330 feed into a request for service 350. Using the present invention, transformations are dynamically generated to match up the appropriate responses with the appropriate requests. Specifically, transformation 360 generates a request data structure for service 340 from the response data structures from services 310 and 320, and transformation 370 generates a request data structure for service 350 from the response data structures from services 320 and 330. Reference is now made to FIG. 4, which is a simplified flow chart of a semantic registration process performed by a service provider, in accordance with a preferred embodiment of the present invention. At step  410 the service provider formally models real world concepts related to the service's functionality. Specifically, for a service provider, allowing semantically based interactions starts with defining an ontology for the real-world domain of a service. The provider creates a “semantic model” of real life logic underlying the service. Such a model is preferably based on principles of ontology models, conceptual constructs representing the science of meaning. At step  430 the service provider maps elements of the WSDL messages to semantic concepts. 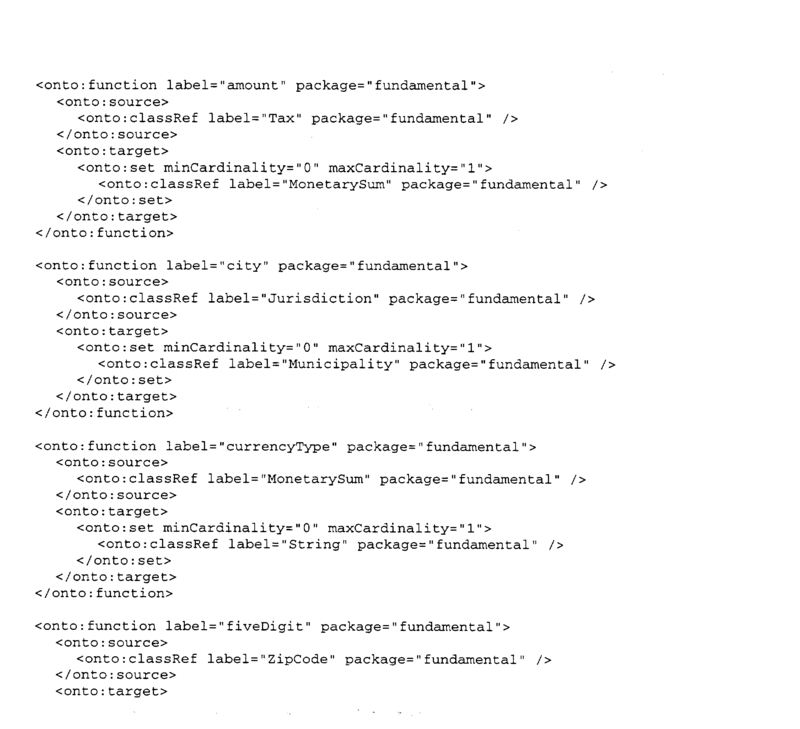 At this step, the provider preferably expresses the meaning of the WSDL by mapping schemas of the WSDL input and output messages to the ontology. At step  440, the provider saves the semantic model, the WSDL and the mappings to a UDDI registry, for client access. Reference is now made to FIG. 7, which is a simplified block diagram of saving a model  710, a WSDL document 720, and mappings 730 between the WSDL interface and the model, to a UDDI registry 740, in accordance with a preferred embodiment of the present invention. After completion of step  440, the web service is ready for semantic discovery. Reference is now made to FIG. 8, which is a simplified flow chart of a semantic discovery process performed by a client who needs to discover a service that meets his required business needs, in accordance with a preferred embodiment of the present invention. At step  810 the client identifies a required functionality. Preferably, the client first accesses an agreed-upon semantic model using UDDI. 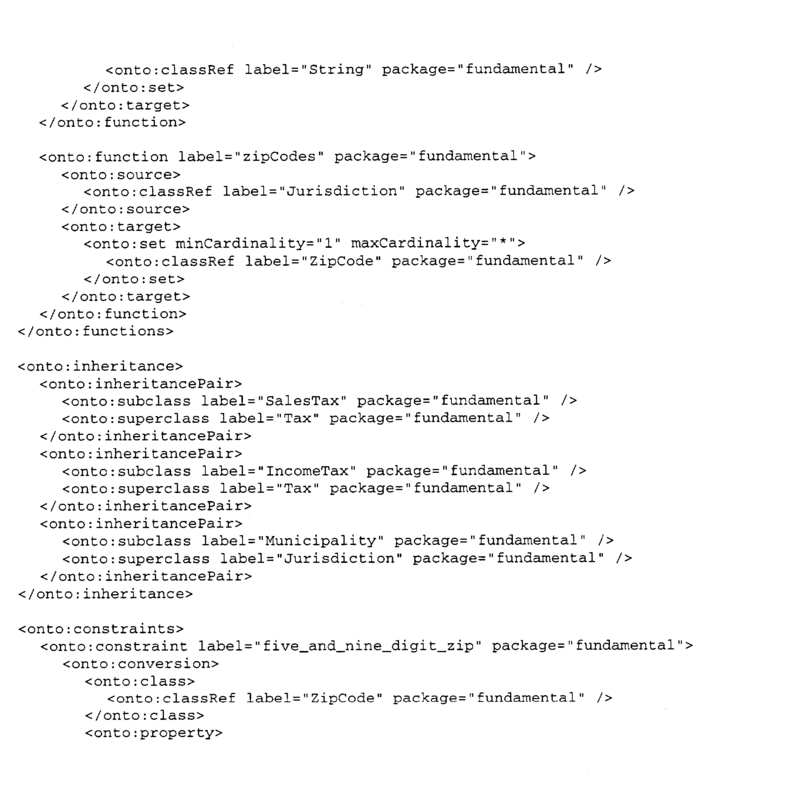 The techniques to do so resemble use of UDDI for accessing other resources; namely, the client locates an XML document representing the semantic model by finding an appropriate tModel, based on industry sector and general taxonomies. 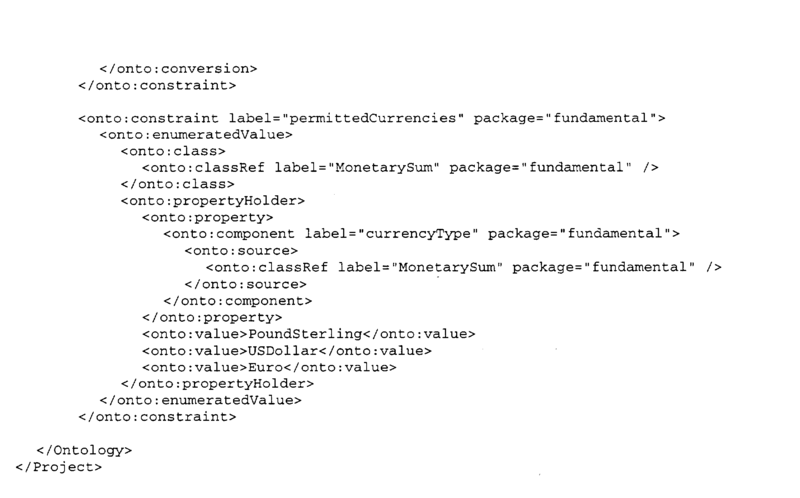 At step  820, the client issues a semantic query for a WSDL document for a service with desired functionality. Having identified relevant semantic concepts in the model at hand, the client can navigate mappings that link the model to the desired WSDL files. The client thus discovers a WSDL file with a function whose input and output schemas are mapped to the input and output model concepts. At step  830, the client uses the WSDL to access the web service. 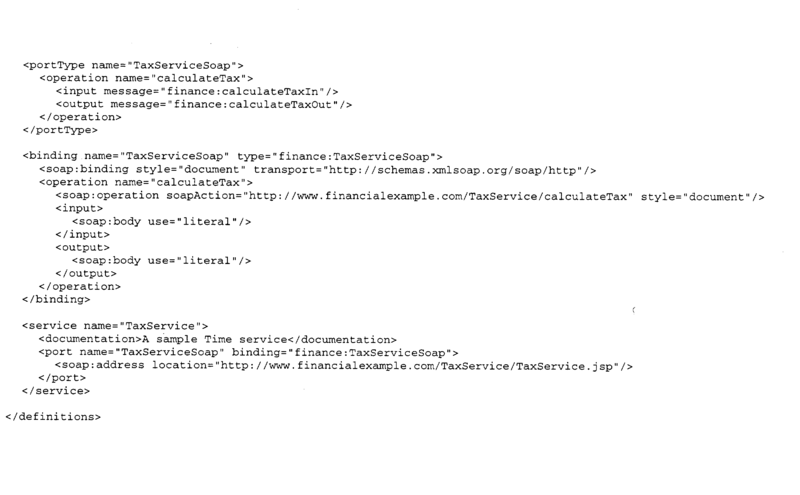 With a WSDL document available to fully characterize the Web Service, the client can call on the web service directly. Once the client has discovered a sought after WSDL, a developer can manually write software to use it. Alternatively, in a preferred embodiment, the present invention may be used to automatically adapt software coded to use a different WSDL, say, WSDL #1, so as to be able to use the WSDL discovered at step  620, say, WSDL #2. Specifically, the present invention automatically generates a transformation to transform the input of WSDL #1 into the input of WSDL #2, and a transformation to transform the output of WSDL #2 into the output of WSDL #1. Such transformations enable existing software that operates with WSDL #1, to automatically process input and output for WSDL #2, without the need for manual software development. Reference is now made to FIG. 9, which is a simplified flow chart for the use of transformations to adapt a software application that is coded for a first WSDL document so as to operate with a second WSDL document, in accordance with a preferred embodiment of the present invention. At step  910 a software application that is coded to use a web service corresponding to a first WSDL document, WSDL #1, prepares input conforming to WSDL #1. At step 920 a transformation is used to transform input conforming to WSDL #1 to corresponding input conforming to a second WSDL document, WSDL #2, for use with a web service corresponding to WSDL #2. The web service corresponding to WSDL #2 may be an update version of the web service corresponding to WSDL #1, or it may be a different service altogether. At step  930 the input conforming to WSDL #2 is sent to a web service, which processes the input to derive an output therefrom. At step 940 the output from the web service, which conforms to WSDL #2, is sent back to the software application. At step 950 the output conforming to WSDL #2 is transformed to corresponding output conforming to WSDL #1. Finally, at step 960 the output conforming to WSDL #1 is used by the software application, as expected. Reference is now made to FIG. 10, which is a simplified block diagram of a system that adapt a software application that is coded for a first WSDL document so as to operate with a second WSDL document, in accordance with a preferred embodiment of the present invention. Shown in FIG. 10 is a software application  1010 coded so as to use a web service corresponding to a WSDL document, WSDL #1. Using the present invention, software application 1010 is automatically adapted so as to use a web service 1020 corresponding to a WSDL document, WSDL #2. An input transformation 1030 transforms input conforming to WSDL #1 into corresponding input corresponding to WSDL #2. Similarly, an output transformation 1040 transforms output conforming to WSDL #1 into corresponding output conforming to WSDL #2. Together, transforms 1030 and 940 enable software application 1010 to run using web service 1040. Reference is now made to FIG. 11, which is a sample user interface window  1110, in accordance with a preferred embodiment of the present invention. Shown in window 1110 is a frame 1120 with a hierarchical list for accessing enterprise data repositories and data management processing. Also shown in window 1110 is a frame 1130 with a hierarchical list for accessing components within a repository or process selected in frame 1110. Specifically, “Assets” is highlighted in frame 1120, and accordingly frame 1130 includes a list for accessing enterprise data assets. A relational database “CRMSystem” is shown highlighted in frame 1130. Data from CRMSystem is used to derive parameters for a web service. Also shown in window  1110 is a frame 1140 with detailed information about the selected relational database CRMSystem. Specifically, a “Mapping” tab 1150 is selected, and frame 1140 displays mapping information for a mapping from a table named “Addresses” to a corresponding ontology class named “PhysicalAddress.” Frame 1140 enables a user to sequentially view rows of the Addresses table and corresponding instances of the class PhysicalAddress. As shown in frame 1140, the Addresses table contains a field “zip,” which corresponds to a property “postalArea” of class PhysicalAddress. The specific row displayed in frame 1140 contains “SW18 3JP” in its “zip” field, and likewise the specific instance displayed has “SW18 3JP” for its PhysicalAddress.postalArea property. generating a transformation for producing data conforming to the request data structure for the second service, corresponding to data conforming to the response data structure for the first service. 2. The method of claim 1 wherein said generating a transformation is performed within a third service. 3. The method of claim 2 wherein the third service also executes the transformation, thus serving as a broker between the first and second services. 4. The method of claim 1 wherein the first and second services are web services, and wherein the request and response data structures are formatted as messages. 5. The method of claim 1 wherein the first and second services are remote procedure call (RPC) systems. 6. The method of claim 1 wherein the first and second services are remote function call (RFC) systems. 7. The method of claim 6 wherein the remote function call systems are Common Object Request Broker Architecture (CORBA) systems. 8. The method of claim 6 wherein the remote function call systems are remote method invocation (RMI) systems. 9. The method of claim 6 wherein the remote function call systems are Distributed Component Object Model (DCOM) systems. 10. The method of claim 6 wherein the remote function call systems are systems associated with enterprise information systems. 11. The method of claim 1 wherein said generating occurs within an application that uses the first and second service. 12. The method of claim 1 further comprising executing the transformation within an application that uses the first and second service. 13. The method of claim 1 further comprising mapping the request and response data structures of the first and second service into a common data model, and wherein said generating is based upon said mapping. 14. The method of claim 13 wherein the common data model is a common ontology model. 15. The method of claim 1 wherein the transformation is expressed using a Python programming language. 16. The method of claim 1 wherein the transformation is expressed using a Java programming language. 18. The method of claim 17 further comprising mapping the request and response data structures of the first and second service into a common ontology model, and wherein said generating is based upon said mapping. 19. The method of claim 17 wherein the transformation is expressed using a Python programming language. 20. The method of claim 17 wherein the transformation is expressed using a Java programming language. 22. The method of claim 21 further comprising mapping the request and response data structures of the first and second service into a common ontology model, and wherein said generating is based upon said mapping. 23. The method of claim 21 wherein the transformation is expressed using a programming language. 24. The method of claim 23 wherein the programming language is a Python programming language. 25. The method of claim 23 wherein the programming language is a Java programming language. 26. The method of claim 23 wherein the programming language is an XML programming language. 27. The method of claim 26 wherein the XML programming language is XSLT. 28. The method of claim 23 wherein the programming language is a Perl programming language. 29. The method of claim 23 wherein the programming language is a C++ programming language. 30. The method of claim 23 wherein the programming language is a Visual Basic programming language. 31. The method of claim 23 wherein the programming language is a Delphi programming language. 32. The method of claim 23 wherein the programming language is a C# programming language. 33. The method of claim 23 wherein the programming language is a Smalltalk programming language. mapping the at least one input and output structure into a common ontology model. 35. The method of claim 34 wherein the first and second services are web services, and wherein the request and response data structures are defined in a Web Services Description Language (WSDL) file. 36. The method of claim 34 wherein the first and second services are remote function call (RFC) systems. 37. The method of claim 36 wherein the remote function call systems are Common Object Request Broker Architecture (CORBA) systems, and wherein the request and response data structures are defined in an Interactive Data Language (IDL) file. 38. The method of claim 36 wherein the remote function call systems are remote method invocation (RMI) systems, and wherein the request and response data structures are defined in a Java interface. 39. The method of claim 36 wherein the remote function call systems are Distributed Component Object Model (DCOM) systems, and wherein the request ad response data structures are defined in a Microsoft Interface Definition Language (MIDL) file. 40. The method of claim 34 wherein the first and second services are web services, and wherein the request and response data structures are defined in a Universal Description Discovery and Integration (UDDI) registry. 41. The method of claim 34 wherein the first and second services are web services, and wherein the request and response data structures are defined in an Electronic Business Extensible Markup Language (ebXML) registry. 42. The method of claim 34 further comprising accessing the at least one web service within an application using a registry accessed through a Java API for XML (JAXR). mapping the data structures of the plurality of Java beans into a common data model. 44. The method of claim 43 wherein the common data model is a common ontology model. mapping a property of the Java class into a corresponding property of the ontology class. 46. The method of claim 43 further comprising translating semantically between two Java beans, using correspondences produced by said mapping. a transformation generator coupled to the interface, the transformation generator generating a transformation for producing data conforming to the request data structure for the second service, corresponding to data conforming to the response data structure for the first service. 48. The system of claim 47 wherein said transformation generator resides within a third service. 49. The system of claim 48 wherein the third service also executes the transformation, thus serving as a broker between the first and second services. 50. The system of claim 47 wherein the first and second services are web services, and wherein the request and response data structures are formatted as messages. 51. The system of claim 47 wherein the first and second services are remote procedure call (RPC) systems. 52. The system of claim 47 wherein the first and second services are remote function call (RFC) systems. 53. The system of claim 52 wherein the remote function call systems are Common Object Request Broker Architecture (CORBA) systems. 54. The system of claim 52 wherein the remote function call systems are remote method invocation (RMI) systems. 55. The system of claim 52 wherein the remote function call systems are Distributed Component Object Model (DCOM) systems. 56. The system of claim 52 wherein the remote function call systems are systems associated with enterprise information systems. 57. The system of claim 47 wherein said transformation generator is embedded within an application that uses the first and second service. 58. The system of claim 47 further comprising a run-time processor for executing the transformation within an application that uses the first and second service. 59. The system of claim 47 further comprising a data schema mapper for mapping the request and response data structures of the first and second service into a common data model, and wherein said transformation generator uses mappings derived by said data schema mapper. 60. The system of claim 59 wherein the common data model is a common ontology model. 61. The system of claim 47 wherein said transformation generator expresses the transformation using a Python programming language. 62. The system of claim 47 wherein said transformation generator expresses the transformation using a Java programming language. a transformation generator coupled to the design tool, the transformation generator generating a transformation for producing data conforming to the request data structure for the second service, corresponding to data conforming to the response data structure for the first service. 64. 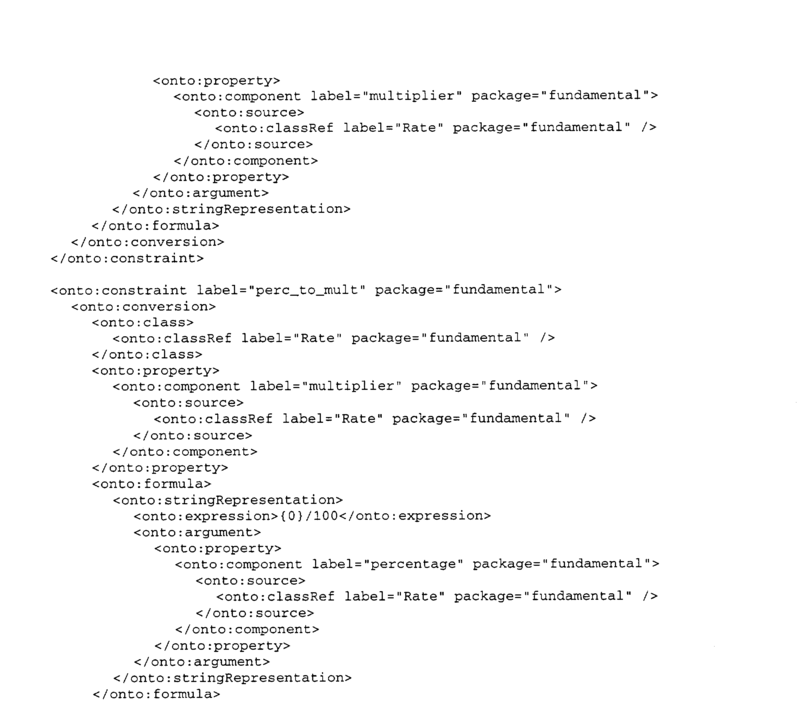 The system of claim 63 further comprising a data schema mapper for mapping the request and response data structures of the first and second service into a common ontology model, and wherein said transformation generator uses mappings derived by said data schema mapper. 65. The system of claim 63 wherein the transformation is expressed using a Python programming language. 66. The system of claim 63 wherein the transformation is expressed using a Java programming language. a transformation generator coupled to the layout analyzer, the transformation generator generating a transformation for producing data conforming to the request data structure for the second service, corresponding to data conforming to the response data structure for the first service. 68. 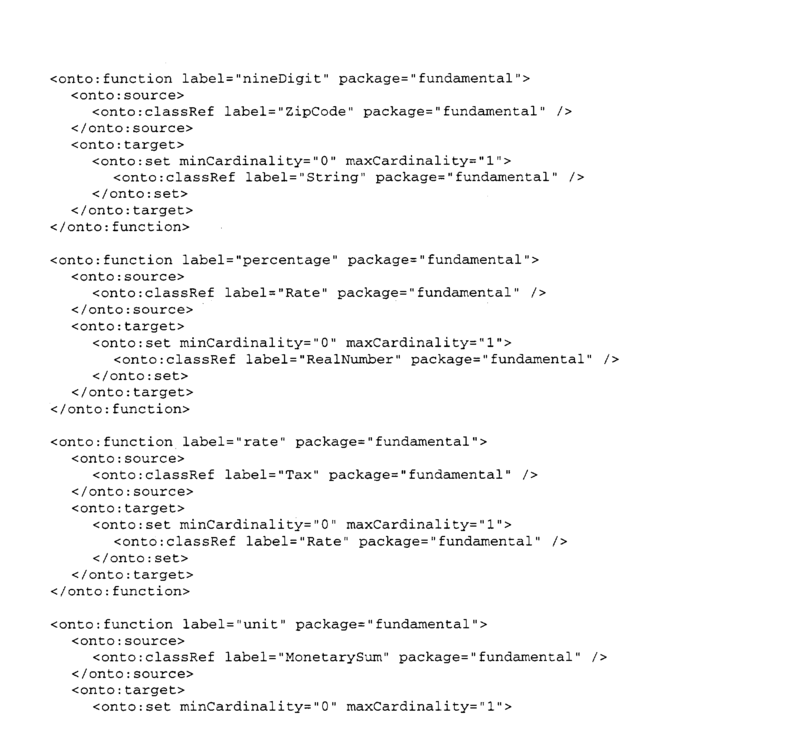 The system of claim 67 further comprising a data schema mapper for mapping the request and response data structures of the first and second service into a common ontology model, and wherein said transformation generator uses mappings derived by said data schema mapper. 69. The system of claim 67 wherein the transformation is expressed using a programming language. 70. The system of claim 69 wherein the programming language is a Python programming language. 71. The system of claim 69 wherein the programming language is a Java programming language. 72. 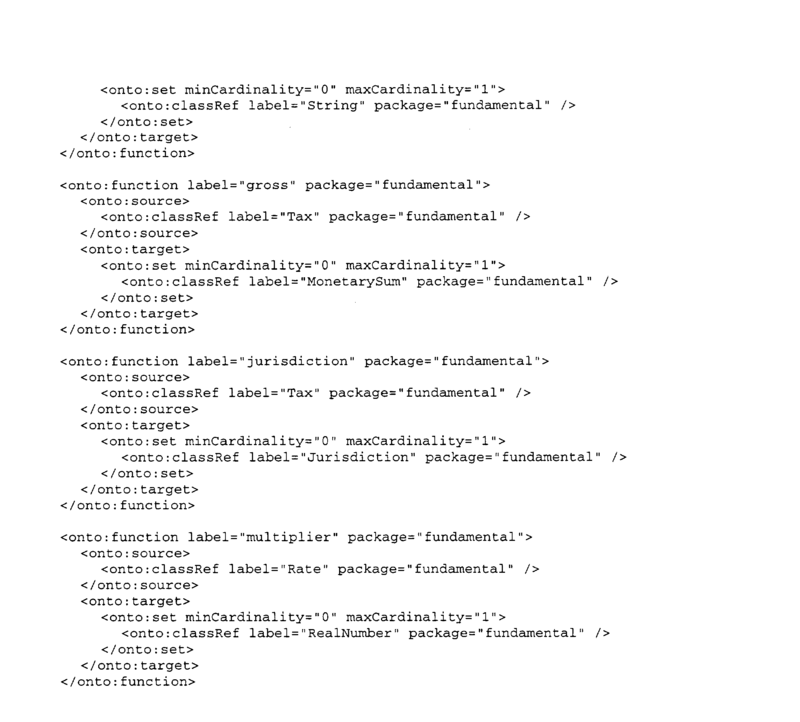 The system of claim 69 wherein the programming language is an XML programming language. 73. The system of claim 72 wherein the XML programming language is XSLT. 74. The system of claim 69 wherein the programming language is a Perl programming language. 75. The system of claim 69 wherein the programming language is a C++ programming language. 76. The system of claim 69 wherein the programming language is a Visual Basic programming language. 77. The system of claim 69 wherein the programming language is a Delphi programming language. 78. The system of claim 69 wherein the programming language is a C# programming language. 79. The system of claim 69 wherein the programming language is a Smalltalk programming language. a data schema mapper coupled to the memory, the data schema mapper mapping the at least one request and response structure into a common ontology model. 81. The system of claim 80 wherein the first and second services are web services, and wherein the request and response data structures are defined in a Web Services Description Language (WSDL) file. 82. The system of claim 80 wherein the first and second services are remote function call (RFC) systems. 83. The system of claim 82 wherein the remote function call systems are Common Object Request Broker Architecture (CORBA) systems, and wherein the request and response data structures are defined in an Interactive Data Language (IDL) file. 84. The system of claim 82 wherein the remote function call systems are remote method invocation (RMI) systems, and wherein the request ad response data structures are defined in a Java interface. 85. 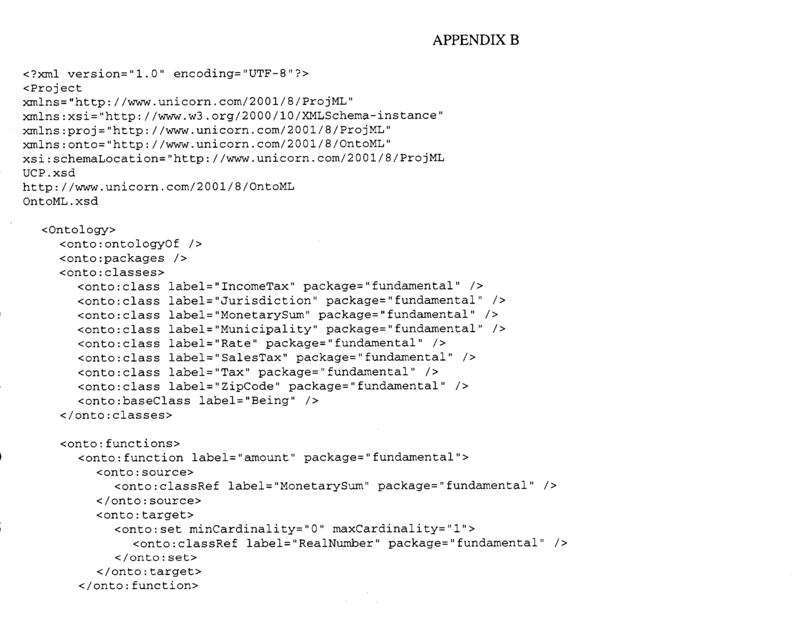 The system of claim 82 wherein the remote function call systems are Distributed Component Object Model (DCOM) systems, and wherein the request ad response data structures are defined in a Microsoft Interface Definition Language (MIDL) file. 86. The system of claim 80 wherein the first and second services are web services, and wherein the request and response data structures are defined in a Universal Description Discovery and Integration (UDDI) registry. 87. The system of claim 80 wherein the first and second services are web services, and wherein the request and response data structures are defined in an Electronic Business Extensible Markup Language (ebXML) registry. 88. 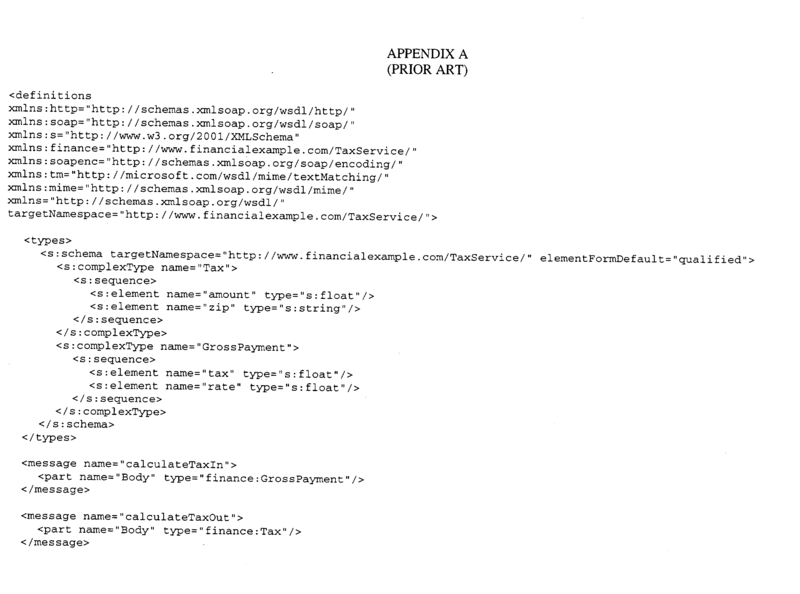 The system of claim 80 further comprising accessing the at least one web service within an application using a registry accessed through a Java API for XML (JAXR). a data schema mapper coupled to the Java bean analyzer, the data schema mapper mapping the data structures of the plurality of Java beans into a common data model. 90. The method of claim 89 wherein the common data model is a common ontology model. 91. The system of claim 90 wherein said data schema mapper maps a Java class into a corresponding ontology class, maps a property of the Java class into a corresponding property of the ontology class. 92. 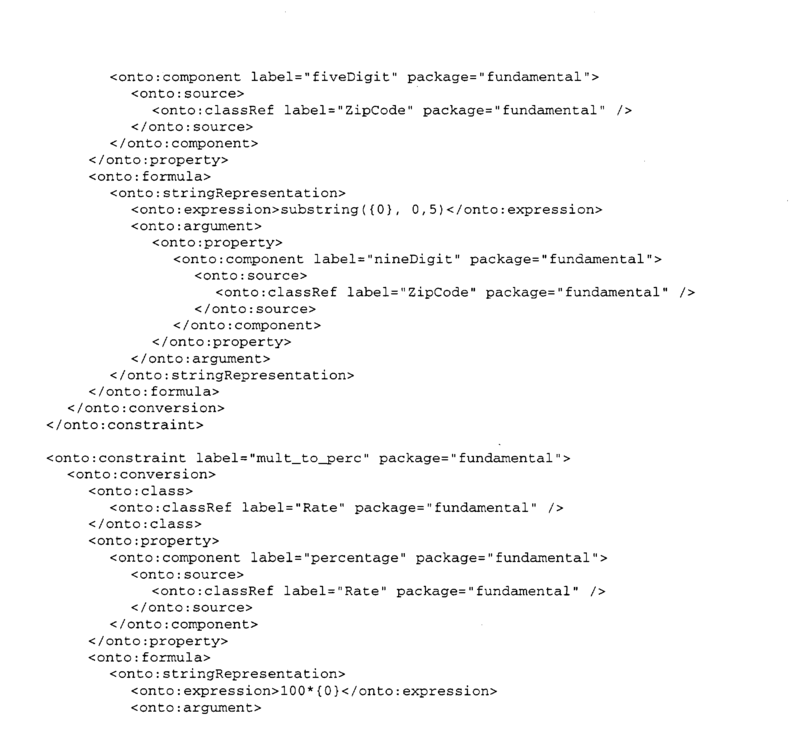 The system of claim 89 further comprising a semantic translator for translating between two Java beans, using correspondences produced by said data schema mapper. mapping the request and response data structures of the plurality of web services into a common ontology model. a data schema mapper coupled to the web service analyzer, the data schema mapper mapping the request and response data structures of the plurality of web services into a common ontology model.